Panasonic has developed LCD signs that can beam ID codes linked to ads and other information to smartphone cameras that are 5 meters away or farther. It’s promoting the technology as an advance beyond QR codes, which require users to hold their phones close to a code when scanning it, as well as a high-speed form of communications using light. The Hikari ID technology is based on ID signals sent by LEDs that form the backlight of LCD signage. The LEDs flicker on and off at a rate that is imperceptible to the human eye, but it can be picked up by smartphone camera sensors. The data is divided into blocks to achieve a rate of transmission of several kilobits per second, according to Panasonic. That’s significantly faster than conventional speeds for visible light communication (VLC), a data communications method that can also be triggered by LEDs. An associated Hikari ID app on a smartphone can call up relevant ads or websites from cloud servers. The system also works when smartphone cameras are pointed at objects that are being illuminated by the flickering LEDs, so museum and other display applications are possible. 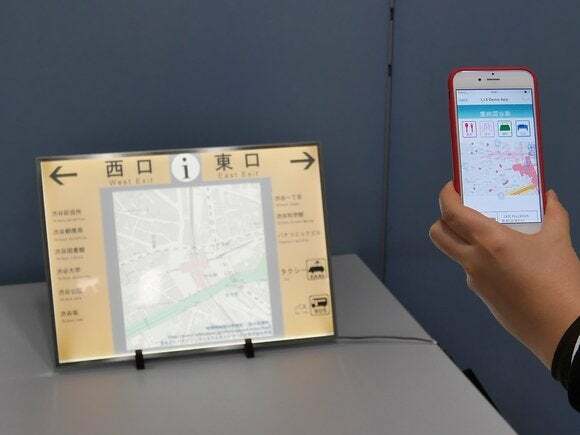 “This system could also be used in trains or subways—for instance travelers could benefit by the app automatically translating station names or other information by detecting a smartphone’s language settings,” a Panasonic spokesman said. The technology will first be targeted at retailers, however, and Panasonic is planning to try it out in a Tokyo department store. The approach is similar to Fujitsu’s recent use of LED light reflected off objects it illuminates to call up linked information via smartphone camera sensors. But while Fujitsu uses color modulation to change the red, green and blue (RGB) mix in LED lights to encode ID data, Hikari ID uses on-off flickering and doesn’t need LEDs equipped with color modulators. Fujitsu’s system also has a slower data speed at 10bps. Panasonic said it plans to show off the technology at CES next month in Las Vegas, and to commercialize it some time in the year ending March 31, 2016.